To make woven PP Bags, we use continuous fibers, which are then converted into fabric by using various types of looms (Weaving or knitting). Then the fabric is laminated or coated. We buy in woven PP fabric and make it into bags. In a Spunlaid non-woven the fibers are directly taken onto a moving web arranging them randomly. The unprocessed web looks somewhat similar to that of a cotton. This fibers on this web are then bound together Thermally or Mechanically. 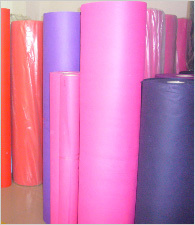 The important technical difference between a woven and non-woven fabric is the strength. Woven fabrics can have much higher strength than that of NW of same GSM. There are various other differences based on the method of manufacturing, material used, etc.